Communigis is a Platform as a Service that communicates large volumes of geographical information between technical and decision-making environments using the web. 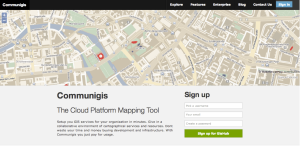 CommuniGIS helps their customers make a simple map for decision-making purposes. Their GIS data repository for technicians allows integration with other GIS, such as ArcGIS, by using standard protocols, which avoids duplication of information. There is a large number of companies (such as mining, electrical) that work with a huge volume of geographical information to represent different operational contexts that involves the usage of complex GIS systems. Working with geographical information across the whole company can be a very costly process in terms of human, hardware and software resources. CommuniGIS is a common cloud GIS platform to store, view and manipulate your data in the cloud, and it is a potential alternative of myriad desktop GIS software. One very important feature of CommuniGIS is the option to use Spanish language in the software interface. Written by Timur Pozhidaev, 10/01/2015.